Why is SongDoor more advantageous to songwriters than other contests? Because even if you don’t win one of the larger awards, you still get a totally free all-access trial to SongU.com to help you improve your craft, along with a free Broadjam FILM & TV membership and free songwriters' software. That’s at least $220 of tangible help. Why do we do it? Because we understand what it’s like to live the songwriting life, and we want to do what we can to help more songwriters have a better shot at getting their songs heard. Nobody loses. You win, even if you don’t. 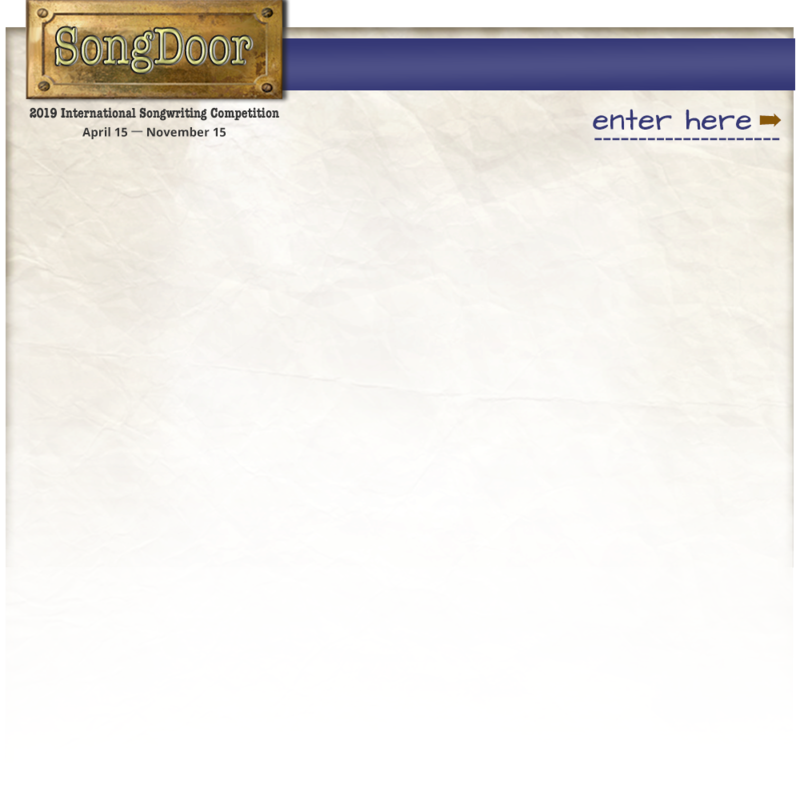 SongDoor entry fees are also much less expensive than other competitions. Please see the next FAQ. How much does it cost to enter SongDoor? The fee is only $10 per entry — far, far less than most other competitions. Even if you order an evaluation of your song during the entry process, the total cost is still a third less than most other competitions. When do I get my free songwriting tools? You can expect an email with instructions for downloading your software and accessing your free trial within a week of the winners' announcement, which is always on January 22. Other contests just take my money and I never hear anything again. It makes me feel like I’ve been ripped off. Is SongDoor any different? Our entrants love our personal touch. Read about it here. What if I have a song that doesn't seem to fit a specific category? Just choose whichever category seems closest. If you think it’s half one category and half another, enter the song in both categories to improve your chances. Examples can be seen here. I’m not a great singer and my home recording equipment isn’t the best. Is that going to affect my chances of winning? Not at all. This is a songwriting competition, not a performance or a production competition. It’s all about the originality, melody, composition and structure, and lyrics of the song. One of our best entries was just a guy and a guitar, recorded in his bathroom! Note: while we screen all songs for possible film and TV placement, only fully-produced "ready-to-go" demos will be tapped for consideration. Can I enter a song I wrote if the rights are owned by a publishing company? Sorry, no (unless you own the publishing company and retain all rights). You and/or your co-writers must own ALL rights to every song you enter. Do I lose the copyright on my songs if I submit them to SongDoor? NO. You retain ALL rights. Period. Do I have to sign up for anything in order to submit online? NO. You will never be asked to sign up for anything here. You can voluntarily sign up for our mailing list if you want to. We will never, ever sell or rent or give your information to anyone. Yes, via PayPal. This is the only payment method we accept because it keeps our entry fee low and is the best way to accommodate international entrants. You do NOT have to have a PayPal account to use it. Can I enter my song(s) from a country other than the U.S.? Yes; last year we had entries from 22 countries! Every song has an equal chance, no matter where it comes from. If it's written in a language other than English, the lyric sheet must be translated into English. It may be performed in any language. I want to understand why my song didn't get an Honorable Mention or make the finals. We receive thousands of entries each year; not everyone's work can be singled out for recognition. Each song receives scrutiny from multiple judges, and if you'd like us to give you a checklist evaluation with a paragraph of personal comments, you can opt to add that to your entry, right on the entry form. What do I get if I win? You can see all of the awards here. Aside from material stuff, winning is good for your confidence. You’ll have an award to put on your résumé, and you’ll be taken more seriously. We also send out a worldwide press release announcing the winners, and post your song on the site for the whole planet to hear. How and when will winners be announced? Finalists are announced on January 8 and the winners are announced on January 22. The winners and the winning songs will be posted on the website. Winners will be notified by e-mail and/or phone. What if a judge loves my song and wants to publish or record it? This is entirely possible; in fact, this has happened many times already. If this happens to your song, the interested judge may request your name and when the competition is over; we will contact you to ask permission to put you in touch.